Our latest paper shows a new technique for 3D printing of cells and other biological materials as part of a single production process. It’s another step towards being able to print complex, living structures. But it’s not organ transplants we see as the most important possible consequence of this work. 3D printing was first developed for rapid fabrication of industrial parts using methods known as sterolithography and fuse deposition modelling. 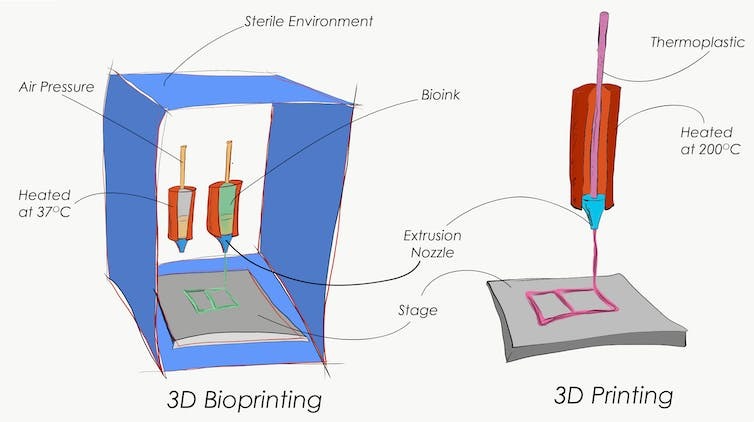 Add “biology” (that is, cells) to the printing technique and it becomes an entirely new process: 3D bioprinting. 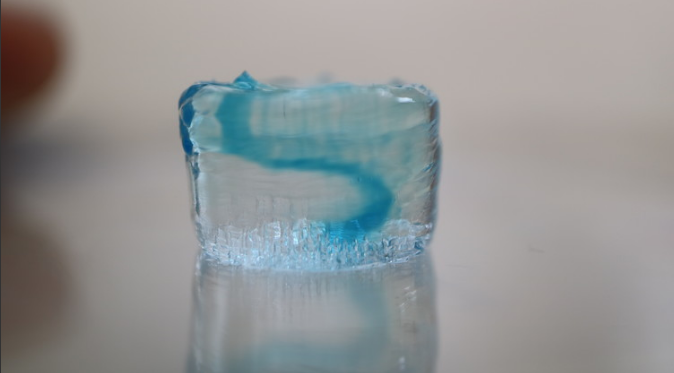 We and other researchers around the world are developing materials that can be manipulated in a 3D printer while causing minimal harm to the cells. However, each cell type that makes up the different tissues of the human anatomy requires a unique mechanical environment. Each requires unique structural supports to function normally. 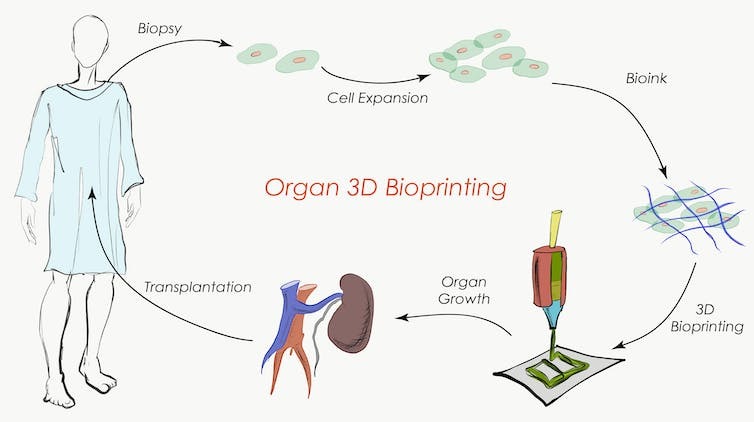 The development of 3D-printed biological tissues for organ replacement hopes to offer a new solution for the 1,500 patients on the organ receiver waiting list every year in Australia. But printing of entire organs is an incredibly complex process, one that takes weeks of time that a patient may not have up his or her sleeve. Using current methods, bringing a new drug to market has been estimated to cost US$2.5 billion, and can take more than ten years from start to finish. Even if you manage to identify a new candidate drug, the likelihood of regulatory approval is low: in 2016, less than 10% were approved. When starting human clinical trials, the probability of a drug to make it to the market is between 10 and 15% depending on the type of molecule , with illness or even death for participants. We know that these drugs mainly fail due to poor efficacy in humans despite promising results in animals. This disconnect is due to the different physiology between species: rodents and other trial animals are very different from humans in many key ways. 3D printing technology allows us to print more complex 3D models that reproduce aspects of the liver, kidneys or heart muscles that are suitable to test and identify novel pharmaceutical molecules. These models are already starting to be used by multinational pharmaceutical companies. While the use of animals in research is still inevitable, the regulatory agency the Food and Drug Administration and its new director have already started to consider integrating alternatives for drug safety and efficacy assessment. This regulation has accelerated the development of human-based 3D models of skin for the testing of new cosmetic formulations. These resolutions were accepted because the technology was available and has enabled a reduction in the number of research animals. This is about to be translated in Australia as well. 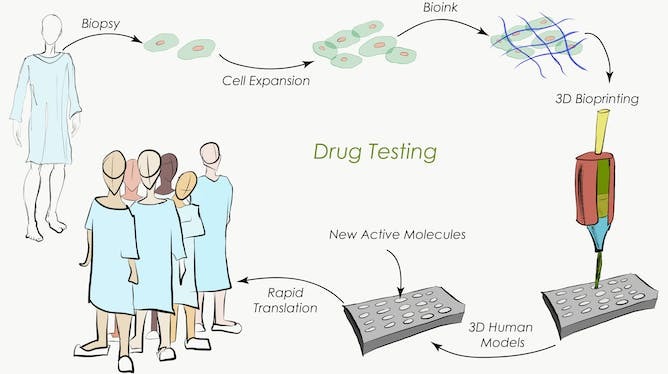 The changes operated in other industries combined with the exciting technological advances let us have a glance at how 3D bioprinting may be able to contribute to faster and cheaper ways to create effective new drugs. Image: 3D bioprinted channel, representing a blood vessel within a hydrogel that mimics human tissue.